Located in side Kathmandu valley the town of Bhaktapur was founded in the 12th century by the King Ananada Dev Malla. From the 12th until 15th century, it remained as the capital of the Malla dynasty. The multitude of temples adorning the city goes well with the name ‘Bhaktapur’ that literally means ‘town of devotees.’ Today the entire town consisting of temples, monasteries, courtyards and houses decorated with woodcarvings has been maintained to preserve its medieval characteristics. 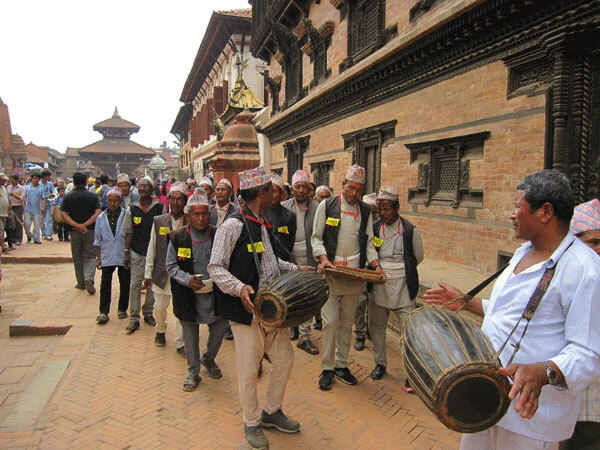 Interestingly, people living here practice ancient culture and traditions giving the feel of living museum to Bhaktapur. In harmony with the charm of mountainous country, hills and villages surround the medieval town of Bhaktapur with natural beauty. Perched majestically on Western hillock of Dolagiri ridge, overlooking the valley floor, artistically built in pagoda style, the two-storied historic temple of Changu Narayan is a sight to behold. The belief is that God resided in this sacred site from the time unknown. Changu Narayan is known as Chapa Narayan, Champak Narayan and Garuda Narayan too. Although the temple is dedicated to Lord Vishnu, the protector, it is visited not only by Vaisnabs, but by Budhists, Ganpats (worshippers of Lord Ganesh), Shaktas (worshippers of Goddess Shakti ), in other words by all Hindus alike. Identified as the oldest temple and one of the nation's eight World heritage sites by UNESCO, the popularity of the temple site area is heightened by visitors from other nations. Garuda in Changu NarayanThe sacred site of Changu Narayan temple, dating back further than the 4th century is the oldest monument listed in the World heritage site in Nepal. Lord Visnu, the protector, resides inside the two - storied pagoda styled temple. Originally built in the 3rd century the temple exhibits highly skilled craft in its woodcarvings, stone carvings and metal carvings. Strewn in its courtyard there are stone inscription of King Mandev from the year 467 AD, statue of Garuda from the same time, and numerous idols dipicting different incarnations of Lord Visnu. A World Heritage Site, Kathmandu Durbar Square is abundant with old palaces, temples, images of deities and old buildings, a majority of them built in between 15th to 18th century during the reign of Malla dynasty. Hanuman dhoka – the main gateway to the palace, Taleju temple, abode of the Living Goddess, fierce image of Kal Bhairab, the ferocious mask of Akash Bhairab, stone column of King Pratap Malla, temples adorned with woodcarvings and specially people who come to worship the deities are the attractions of Kathmandu Durbar Square. The city of Patan is also known as 'Lalitpur' - the town of beauty. The name is justified by ancient art and architectural designs found profuse in temples and palaces of Patan Durbar Square, the palatial area of Patan. Similar to Kathmandu Durbar Square the monuments here date back to Malla dynasty. The infamous Krishna temple, the museum inside Keshab Narayan chowk, Sundari chowk, Bhimsen temple, Taleju temple, the nearby Mahaboudha and the golden temple are the major artistic attractions of this area. Built on top of a hill in Kathmandu valley, the World heritage site of Swoyambhunath is an ideal spot for the all around panorama of the valley, the scenic beauty enhanced by the hills and the snowy mountains in the backdrop. Although a Buddhist shrine, Hindus pay homage too, signifying a strong harmony between the Hindus and the Buddhists of Kathmandu valley. The present stupa of Swoyambhunath – 'the self existing one' was built in the 17th century by the then King Pratap Malla. A relic of Lord Buddha is believed to be placed inside the stupa, making it sacred. Swoyambhunath stupa symbolizes 'Nirvana' - the stage where there is no suffering. Swoyambhunath stupa lies 16 km west of Bhaktapur. Boudhanath stupa, a World Heritage Site is the other major Buddhist shrine in Kathmandu valley. The stupa, largest of its kind in the country, is among the biggest throughout the world. Built in the 5th century, during the reign of the King Mandev, the stupa is a structural embodiment of Nirvana. Monasteries dedicated to four different sects of Tibetan Budhism - Nyingmapa, Kagyupa, Gelugpa and Sakyapa - occupy the surrounding vicinity of Boudhanath stupa marking the area as the center of Tibetans who have settled in Nepal. Regarded as one of the four sacred Hindu temples in the world the shrine of Pashupatinath is dedicated to Lord Shiva. Built in the 17th century the temple glitters in gold and silver. The two storied, pagoda styled temple features roofs made of gold plates and four entrances at four directions of silver, portraying artistic works of highly skilled craftsmen.